This is a relatively easy dinner that we enjoy occasionally around here. When I tell my husband this is what I'm making for dinner, half the time he will ask me to make quesadillas instead, so I usually do both when making this meal. Tonight, though, it's just the nachos with homemade smoothies as our side. I don't know how strange that sounds to some people, but it passes for dinner around here. 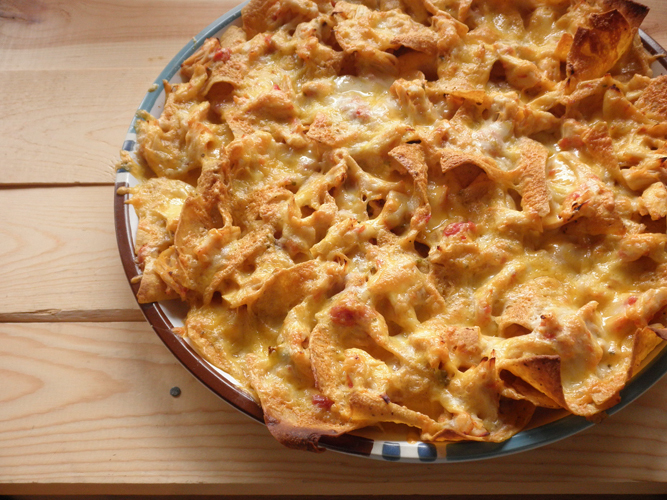 The measurements below are only approximate, as nacho making is not an exact science. The key for me here is the chicken, which, like I said, can be used in quesadillas OR in chicken burritos, which we haven't had in a long time. I'll have to remember that. It only takes about 30-40 minutes to prepare this from start to finish, so it's a nice alternative to McDonalds on a busy night. Use your favorite tortilla chips and your favorite salsa. Make it yours. I think you'll like it. Over medium heat, bring chicken and salsa to a simmer and cook until tender and shreds easily. If you're using the chicken tenders, when chicken is cooked, remove the tendon at the fat end with tongs or a knife and fork. Sprinkle chicken with a little salt and set aside. Turn oven on to broil. Spread tortilla chips onto an oven-proof platter that will hold them in about a single layer, but it's okay if they overlap a bit. Evenly distribute the shredded chicken over the chips. Evenly distribute the cheese over the chicken and chips. Place platter in oven and broil until cheese is melted and bubbly. Stay nearby or put on a timer for two minutes if you have to step away. Keep checking until they're done. Carefully remove from oven with oven mitts and serve. This would probably taste good with guacamole & sour cream, if that's what you're into, but I like mine straight-up. Makes about 3-4 servings for hungry people.